Home | Too Busy to Worry About Saving for Retirement? Let a “Good Enough” Mindset Get You Started. Inside: If “too busy” is your excuse for not getting a start on saving for retirement, find out how a little change in mindset can get you over the initial hurdle. Life is hectic. 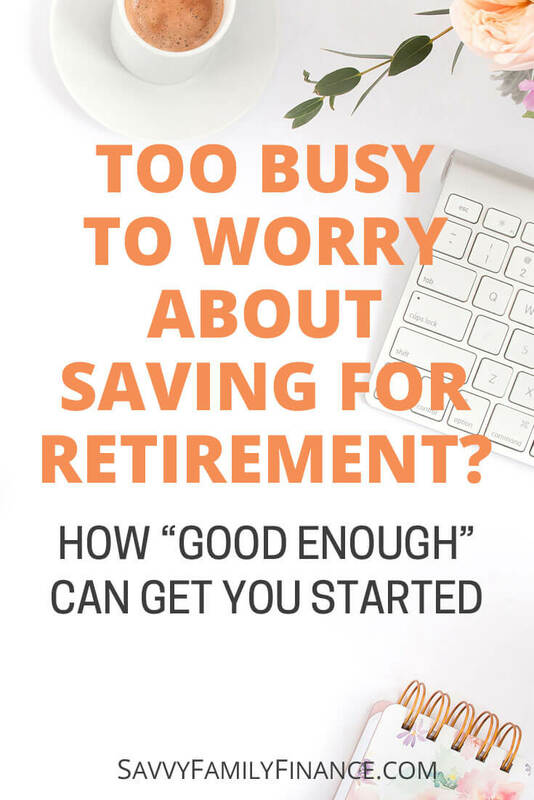 Between kids and work and stuff that needs to get done around the house and that Zumba class and everything else, you might not have had time to even think about doing crazy stuff like start saving money for retirement. You have enough money that you know you should be investing and saving more but…life. The cat coughed up a hairball, your son is washing his hair with the oatmeal you gave him for breakfast and where the heck is your phone? It is hard. But saving money is something you need to do. And I’m here to give you that little push to get you started and know that “good enough” can be enough for now. The plan doesn’t need to be perfect, it just needs to be put in motion. It is okay to not do everything right, just try to do something. You can go back later and learn more and tweak your choices further. For now, let’s get started. Does your work offer a 401(k) but you haven’t bothered looking into it? Not even sure if they offer one or not? Well, let’s take care of this. With motivation and good timing, you might even be able to do this in one day. Step one is to find out if they offer a 401(k) and if you are eligible. Email yourself a reminder at work or slap a sticky note in your purse that says “find out if can do 401k at work”. When you get to work, send an email to HR asking about it. Boom. Done with step one. Step two is if they say yes, then download your options to look over later. BUT, as soon as you download or print them, set a reminder on your calendar to look at them as either lunchtime reading or as something to read after the kids are in bed. Step three is to choose your investments. This can be as long and drawn out and hard as you want to make it. Right now, let’s assume you are looking for good enough and not perfect. Remember, you can fine-tune and change your choices later. Right now, you want to get started. In general, a target date fund or an index fund that follows the S&P 500 are reasonable choices for long-term investing. Steps 4 and 5 are to figure out how much money you want to deposit into the 401(k) each pay period and fill out the paperwork to do so. Assuming you can afford it, at least put in as much as you can to get the full company match, if the company offers one. If you aren’t sure about that amount, then ask HR. Better yet, you can opt to invest the full amount allowed for the year. Right there, you could be saving over 20% of your income and know you are likely doing better than many of your peers. Sign the papers from HR and send them back. If you were fast, you might have even done all this in one day. Or maybe you didn’t stress about it and you took a week to get the paperwork done, but it is done. You are now saving for retirement. Do you have a Roth IRA? It is another way to save and if you want to really bump up your savings, you could be maxing out that 401(k) and your Roth each year when possible. There are two lazy, or at least fairly easy, ways to fund the Roth account each year. One is to set up a monthly auto-deposit. The other is to use your tax refund. What? <gasp!> But you shouldn’t have a tax refund if you are doing your withholding correctly! But really, many of us do get a fairly large refund. And you know what? With interest rates being so low, we’re losing out on a few dollars (if that) of interest? Sure, there is opportunity cost there as well. But if a refund is a way for you to “save up” a Roth contribution for the year, then I say that is fine if that is what works for you. It is a great use of a tax refund. So, you have all these investments and know you need to keep track of where your money is going, but who has time for all that? What can you do to easily keep track of your money and investments? We’ve been using Personal Capital to monitor all our investments. Like other services, you can link up your bank and credit card accounts to track your income and spending. But what a lot of the other services lack is good investment tracking and analysis. I don’t know about you, but not being able to see everything, including investments, in one place drives me a bit batty and makes it harder to see the big picture. That is what makes a service like Personal Capital so nice to use. You can sign in, see the current balance in all your accounts, see how your investments are doing, and call it a day. Best of all is that it is free. If you want to go further, Personal Capital also will let you know if you are paying too much in fees and they’ll even offer advice on changes you can make to meet your goals if you wish to speak with someone. They do offer some services for a fee, but those are optional. Though, it actually might make choices so much easier and take more off your plate. You are busy and stressed. I get it. While I don’t mind researching asset allocations and figuring out what seems best for my family, there are other areas where I need a little push to get things done. We all have something that we dread doing. For you, the words “asset allocation” may make your eyes glaze over. That is fine. Remember taking small, imperfect steps towards your savings goals is better than nothing. Have you started saving for retirement? How do you track your accounts?